You may recall Chipps’ excellent detective work back in early March, when he uncovered a secret new fork from Cane Creek. Called the Helm, this was to be Cane Creek’s first ever fork offering. Having already established a reputation for its highly adjustable Double Barrel rear shocks built around the Twin Tube damping technology, Cane Creek was eager to take on the superpowers of the suspension fork market with its very own front boinger. After numerous prototypes during a particularly long development time, the North Carolina-based brand is finally ready to unleash the Helm – and we have one one on test. No lizards were harmed in the making of this fork. Available in both black (Factory) and blue (Launch) versions, the new Helm looks like, well, err, a fork. We’ve got the Launch edition, which comes in a rather striking deep-blue colour that is going to lead to some epic colour clashes that we’re very much looking forward to. But looks aside, lets take a look at what’s inside the fork to find out what makes the Helm special. 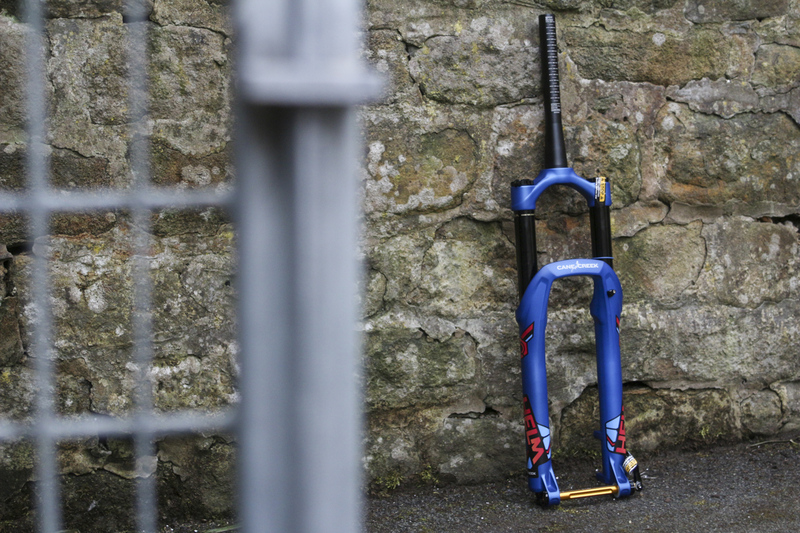 This is the Launch edition of the Cane Creek Helm fork – complete with the Superhero Blue finish. 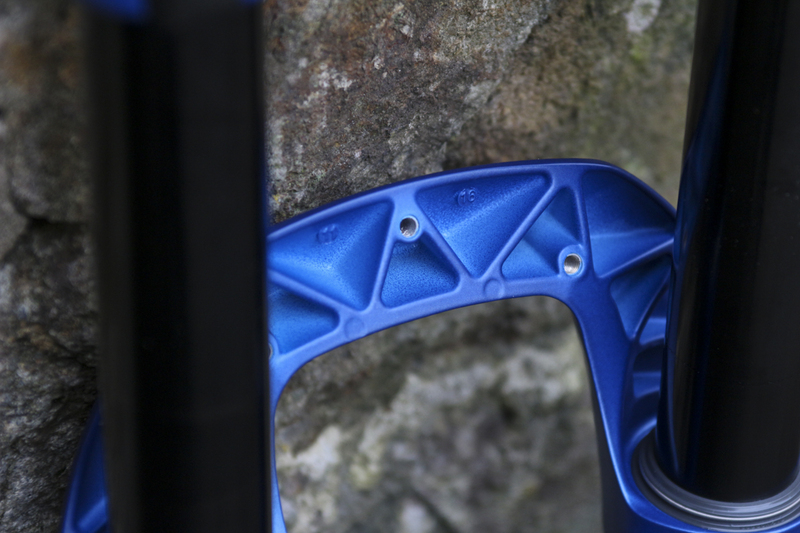 Anodized max travel line on the upper fork stanchion to show how rad you’ve been getting. Firstly though, the basics. 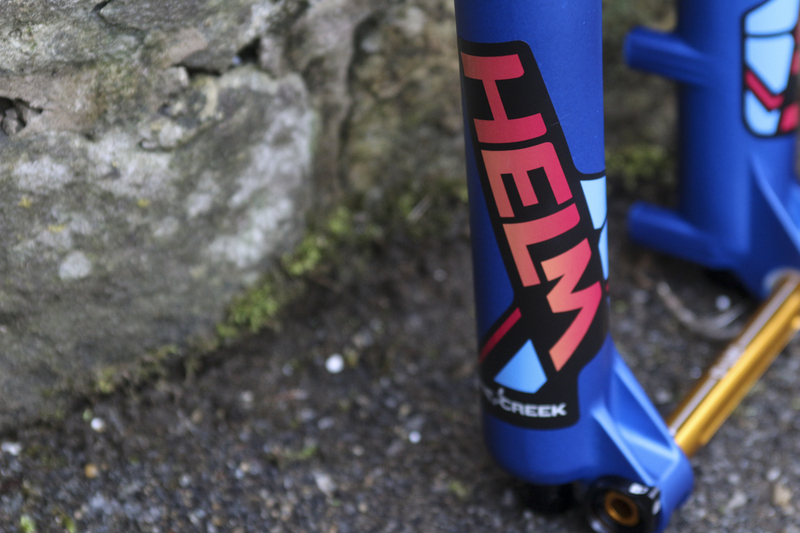 The Helm is a 27.5in fork equipped with 35mm stanchions and 140-170mm of travel. It’s pitched in a similar market space to the Fox 36, the RockShox Lyrik and the Manitou Mattoc. It only comes with Boost spacing for 27.5in wheels, though we’d hazard a guess that more sizes are in the works. 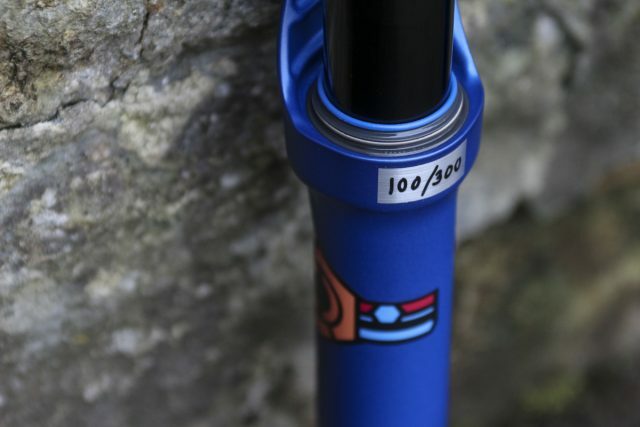 There are only 300 Helm forks available in the blue Launch edition. Exclusive! Hollowed out arch on the magnesium one-piece fork lowers. Cane Creek Helm air spring assembly. Inside the Helm fork is a proprietary air spring designed and engineered by Cane Creek. Most high-end forks out there use an air spring with both a positive and negative air chamber, and it’s this the negative chamber that allows the fork to ‘ease’ into the first 20% of the travel. 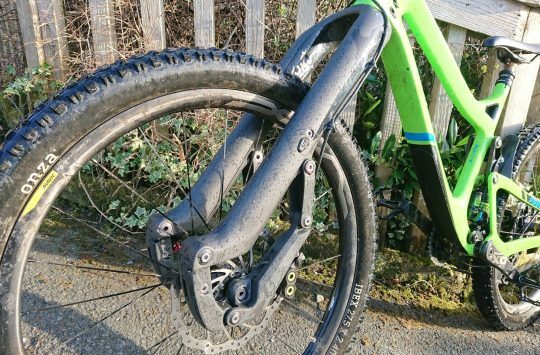 In the case of other fork spring assemblies such as the Solo Air unit found in a RockShox fork, the spring pressure is simply equalised between the two chambers. 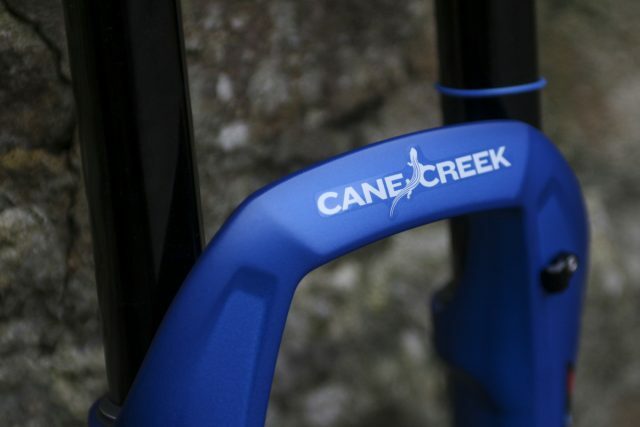 Cane Creek achieves the same thing with the Helm fork, but uses a threaded cap at the base of the left-side fork leg that allows you to manually equalise the fork pressure by pressing in the valve with your finger. 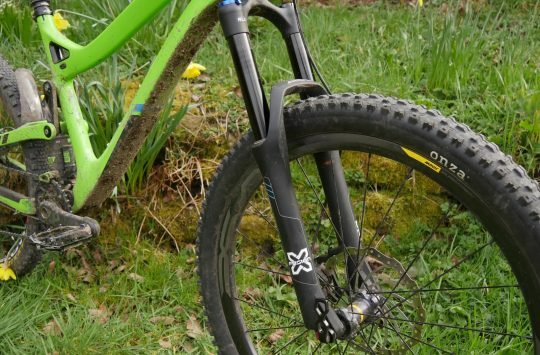 See how the air spring system works in the above video, which shows you how to set sag on the Helm fork. Likely also a rapper’s name, the D-Loc axle is Cane Creek’s way of offering tools-free wheel installation. Also unique to the Helm fork is the D-Loc thru-axle. 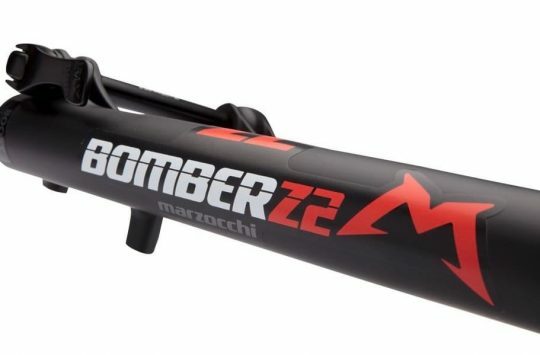 It’s a 110x15mm Boost size, but it’s the way it connects to the fork lowers that’s different. 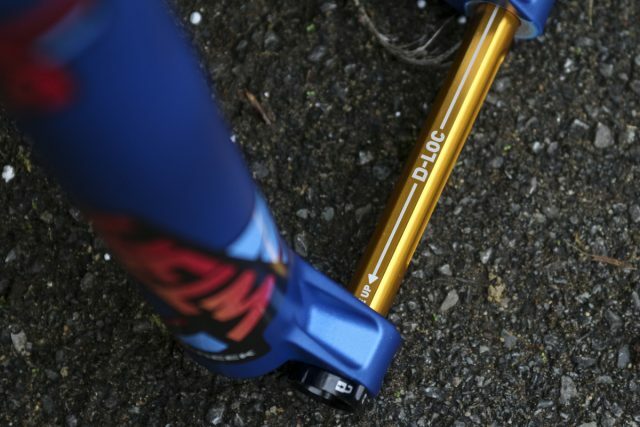 With a keyed profile along the length of the gold shaft, the D-Loc axle will only slot into the fork dropouts in one orientation (that’s why it says ‘this way up’). After sliding through the dropouts, a small black dial on the right-hand dropout twists and locks into place, securing the axle. On the other side of the axle is a quick release lever that you flip and lock down as you would with other brands forks. Wanna see how it works? Cane Creek has a video for that. 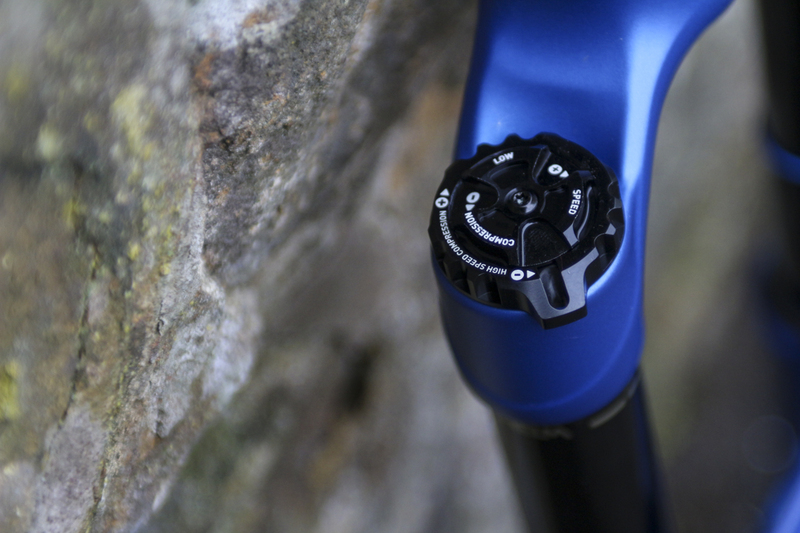 On the damper side of the fork, you’ve got adjustable rebound damping down the bottom, with two black dials on top allowing for independent adjustment of low and high-speed compression adjustment. Combined with the air volume adjustment inside the air spring, there’s loads of knobs and dials for the knob-twiddlers out there. Need more info on where you can get one? Drop a line to Extra UK for all the info. 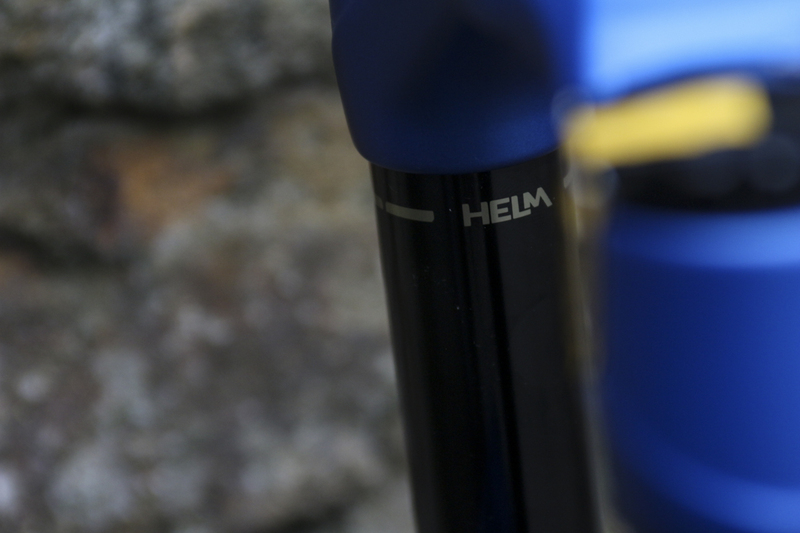 Otherwise checkout last week’s Facebook Live video, where Hannah and Wil go through some of the hands-on features of the new Helm fork. I will be amazed if these sell well after the ongoing Double Barrel Inline debarcle.